The MSI Radeon R9 390X Gaming 8G is an extremely powerful R9 390X custom graphics card. The cooler on this particular card is maybe the most capable model available these days. Apparently, this combination sounds rather compelling, so we're interested to see what it can do in our review. MSI is one of the strongest AMD partners regarding their GPUs. If you've been following all the news in the past you might have noticed, that the 390X is actually a refresh R9 290X with more VRAM. Basically This particular cards features 8 Gigabyte of GDDR5 memory in combination with a 512 Bit memory interface. Already in the past AMD cards were quick at 2160p (UHD / 4K), thanks to the wide memory interface as well as the fact, that there was 4 Gigabyte VRAM with all R9 290 as well as R9 290X cards. It looks like AMD is sticking to that legacy - providing more VRAM than their competitior - and we're certainly curious to find out in what extent this pays off or not. As you can see from the GPU-Z screenshot below, MSI decided to use quite a tiny factory-overclock on the new Radeon R9 390X Gaming 8G. While the reference Radeon R9 390X runs at 1050 MHz GPU clock MSI bumped the frequency by 10 MHz to 1060MHz. A closer look at the memory reveals the AMD board partner overclocked it by 100 MHz. Checking frequencies with Furmark, meaning that we're applying maximum load on the GPU, we see that the card is not throttling on the GPU as well as the memory. Running 3DMark we don't see throttling at all again. 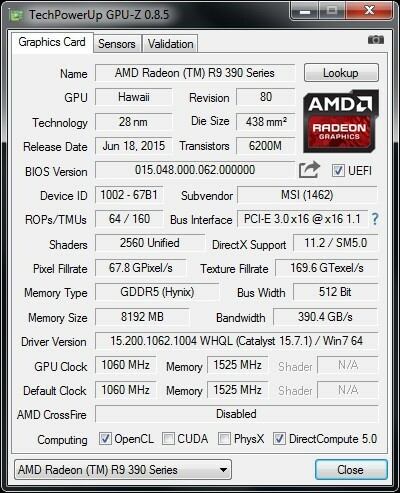 In this case, GPU-Z is telling us that the GPU frequency reamains at 1060 MHz through the entire benchmark. This is also what we've noticed when running games, since there is no throttling whatsoever when running recent titles.